Lauren Tom (born August 4, 1961) is an American actress. Her roles include Lena St. Clair in The Joy Luck Club, Julie in the NBC sitcom Friends, Dot in the final season of Grace Under Fire, and the voices on Futurama as Amy Wong and on King of the Hill as Minh and Connie Souphanousinphone. 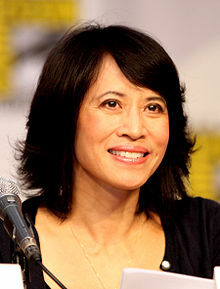 ↑ "Lauren Tom Biography". TVGuide.com. Archived from the original on September 21, 2015. Retrieved July 29, 2017.